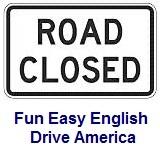 ﻿ Fun Easy English - Drive America - United States of America road signs, rules, and regulations warning, pedestrian. Warning road signs for non-vehicular traffic crossings are used to advise road users in advance of locations where unexpected entries into the roadway or shared use of the roadway by pedestrians, animals, and other crossing activities might occur. Warning road signs for bicycles advise the cyclist of changing road conditions. Warning road signs for schools instruct road users that a school or the possible presence of students is ahead. Possibility of pedestrians crossing the road. Possibility of children crossing the road. Possibility of disabled persons crossing the road. Possibility of horseback riders crossing the road. Possibility of snowmobiles crossing the road. Possibility of cattle crossing the road. Possibility of deer crossing the road. School zone where road users are required to stop for pedestrians within the crosswalk. School zone where road users are required to yield to pedestrians within the crosswalk. Reduced speed limit of 20 miles per hour (mph) in the school zone ahead. Reduced speed limit of 30 kilometers per hour (kmh) in the school zone ahead. School bus stop is ahead. Indicates the bikeway will become more narrow. Indicates the bikeway will experience a steep gradient, hill, or slope. Indicates the bikeway will be slippery when wet. All pedestrian traffic must use an alternative route to the left. All bicycle traffic must use an alternative route to the left. All bicycle and pedestrian traffic must use an alternative route to the left.